Mike and I have found ourselves with child… A ten year old child who will be coming along on all our camping adventures. No matter what we could do, we just couldn’t figure out how to take him in the teardrop trailer. Most RV resorts won’t let us put up a tent next to our trailer, and we couldn’t find a way to squish him in the cabin of the teardrop with us. 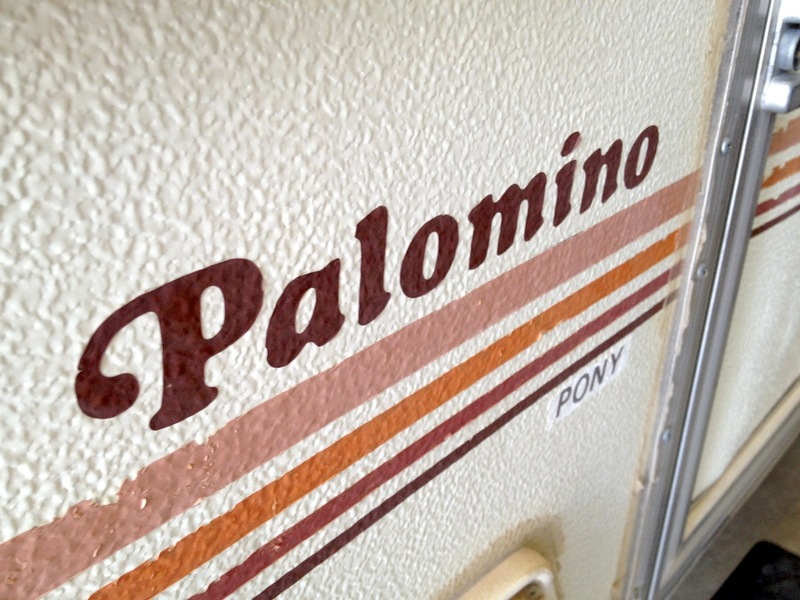 We’re still driving the Prius, so we were really restricted as far as what we could tow, but we found a Palomino Pony tent trailer that weighs only 855 pounds. It pulls even better than the teardrop (probably because the tires are slightly bigger) and our gas mileage was the same, despite the extra weight. 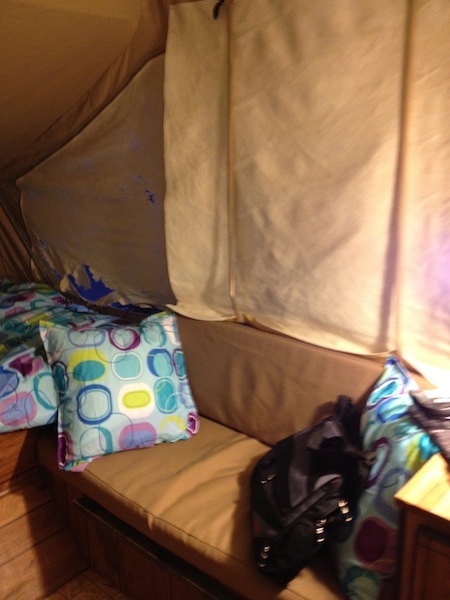 I am currently in the process of cleaning everything and making it camp-worthy before our maiden voyage this weekend. This camper is in MUCH better shape than my Teardrop American Outbacker, so it will need hardly any work to get it up to par. 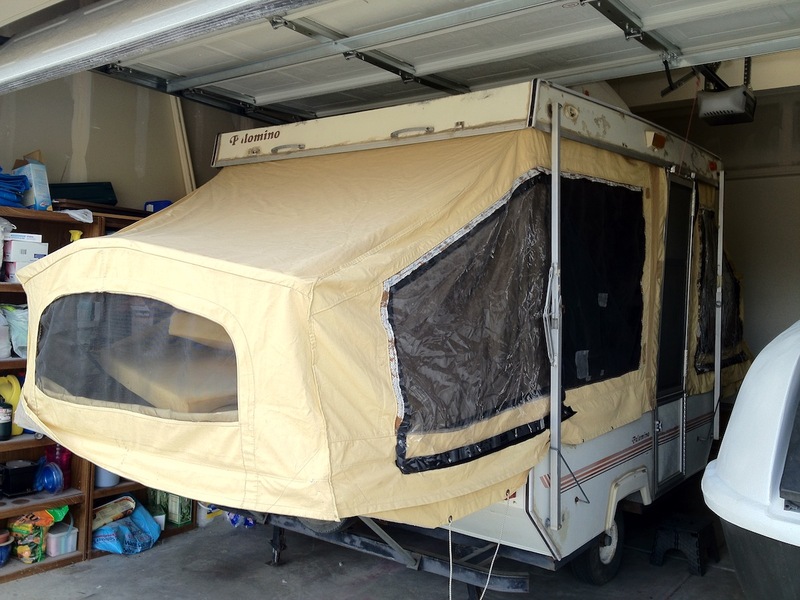 Our garage is packed FULL of trailers right now, and I need to decide if I’m willing to let the teardrop go. My sister is considering buying it, and I would be so happy if it could stay in the family. Otherwise, we’ll have to sell it on eBay. I was able to find the Owners Manual for the trailer, so that should come in handy. I love this trailer because it has an exterior lifting mechanism instead of a crank. It will be a lot easier to fix the lift if it breaks than if the cord snaps on a crank tent trailer. 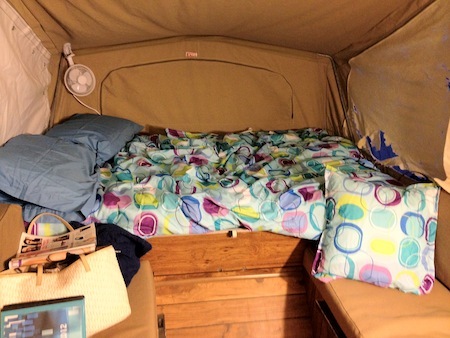 I also love it because there is no sink, stove, or any plumbing in the trailer. Those features being missing makes it light and they’re things that I don’t really want, so they would be in the way if they were there. I used to think, why would anyone want a tent trailer? I now know. 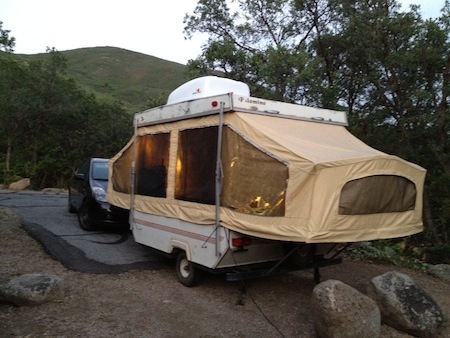 So many RV parks and resorts don’t allow tents, but they’re perfectly willing to let you have a tent trailer. There are so many places on our Epic Journey last season that we wouldn’t have been able to stay at if we hadn’t had the teardrop. The Palomino Pony will do the same for us. My biggest worry is camping in the mountains when it’s cold. We might not be able to test that this weekend, since the temperatures are pretty high this summer, but when September rolls around, we will be able to see how warm the tent trailer can be. I’m pretty sure it’s just not going to cut it. We got this tent trailer for only $500, so it really falls into the Redneck Trailer category for me. It’s ugly as sin with a Sears Cartop Storage container riveted to the roof, but it was cheap and it will be good enough to get us into any trailer park from here to Florida. I can’t wait to take it on an epic journey! 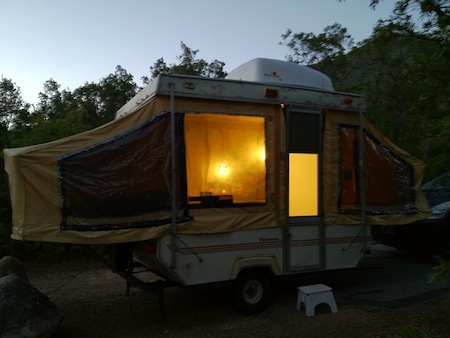 Update 08-29-12: Here are some photos of it from our campout at Wasatch Mountain State Park. My sister DID buy my teardrop trailer, so that freed up my garage a bit and felt good to keep my beloved little teardrop in the family. When we camped at Bear Lake last weekend, the temperatures got down to 46 degrees, but our little heater kept the tent plenty warm enough for us. I’m so excited to have many adventures in this trailer! Question how does the exterior lifting mechanism work. I am looking at an 82 but I am not sure how the exterior lifting mechanism will work.